Lens: Lomo 3.7x Microscope Objective on a set of extension tubes and cheapest bellows in the market. I used the same machine (i7/12GB Ram/SSD Hard Drive) for every step. Although there were not any other processes during that time, the results are still should be considered as approximate. 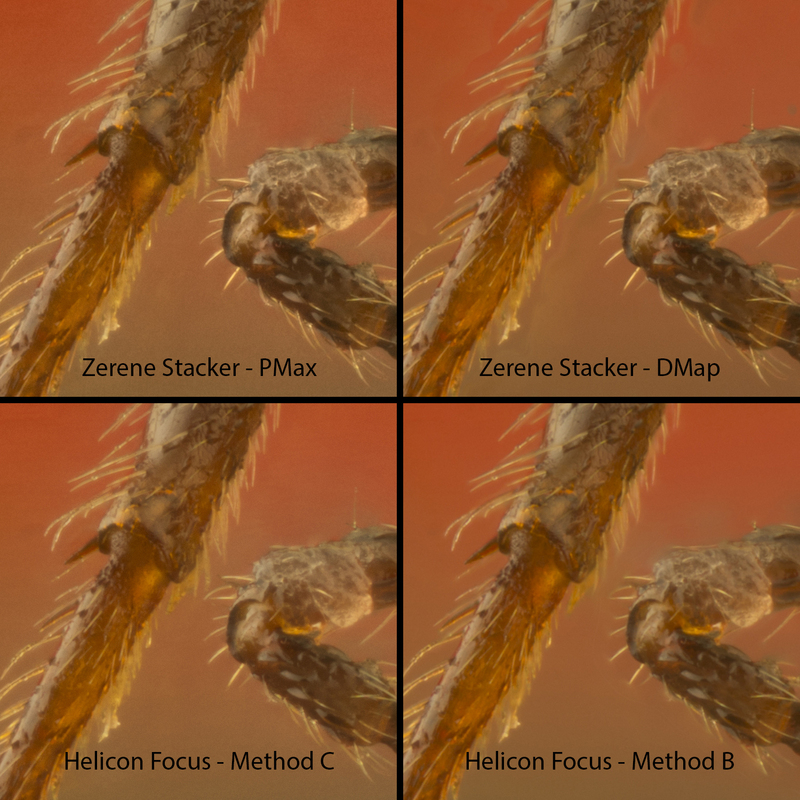 First of all, Helicon Focus has a big advantage over Zerene Stacker in terms of pipeline. Helicon Focus supports raw pipeline with DNG input and output. Zerene Stacker does not have any raw support yet (which makes me surprised). So I stuck with 16 bit TIF export to test Zerene Stacker. With the 16 bit TIF pipeline there is actually no pixel data loss. In fact, this format can hold more color data that a regular DSLR can shoot. DNG file can hold the whole of your data with a optimum size and it can also hold the metadata. Since file size of DNG is much less and make the format easier to load/reload it speeds up the whole pipeline, not only import/export. Wow… I was expecting DNG to be faster but more than two times? I wasnt expecting that. Lets see how they do when actually processing the images. 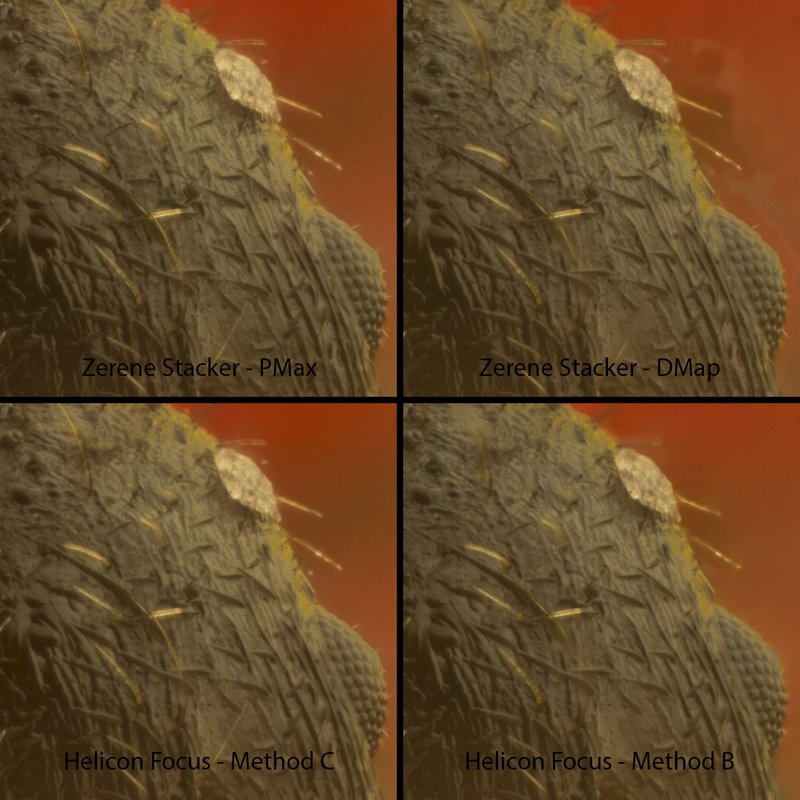 Helicon Focus offers 3 different focus stack methods, which you can retouch and combine them. These are Method A, Method B, and Method C. Methods A and B has Radius and Smooth settings, where Method C does not have any setting. The logic is to collect all data and use the best parts of each. Zerene Stacker only have two options. PMax and DMap. PMax’s algorithm is very similar to Method C (Pyramid) in Helicon. PMax and Method C are relatively faster to calculate compared to the other algorithms. It gives also cleaner results. By cleaner, I dont mean better, but most of the time the results from these methods are usable without any combination. Although the picture is more contrast and it creates something like a halo effect especially on the highlights. Method C and PMax creates an extraordinary job on very thin parts like hair follicles. It also compensates better the Lens breathing effect (or the gaps occurred because of literally moving the camera in this case) compared to the other algorithms. 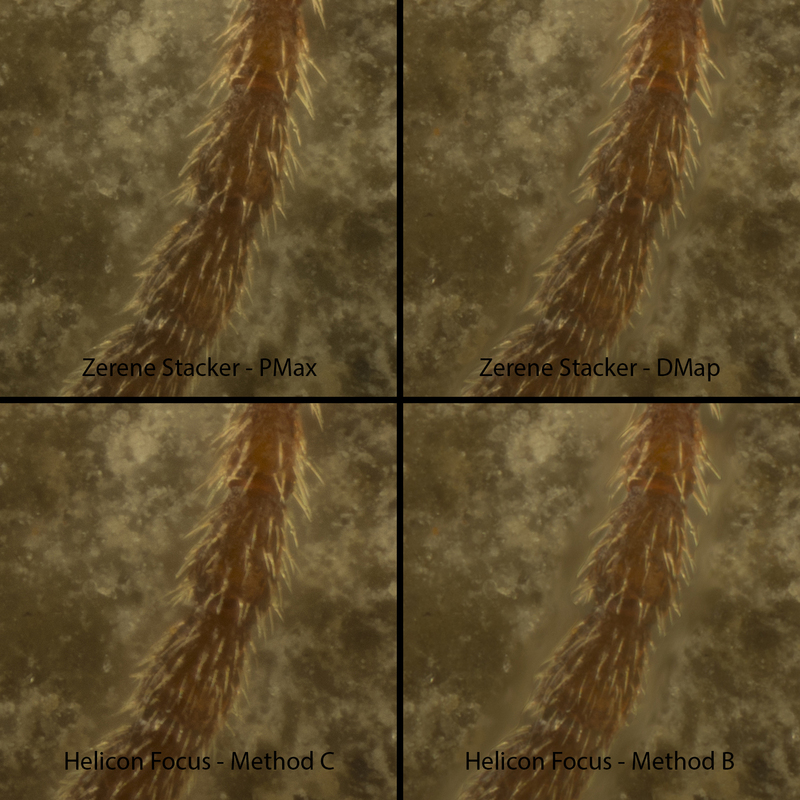 Other methods (DMap in Zerene Stacker and Method A/B in Helicon Focus) creates less noisy, better quality results. They tend to have a wider contrast range too. Ideally, one would want to use most parts of the image from DMap or Method B results. The parts that can not be done well like the edges and thin parts should be retouched either using the original photographs or from other methods. 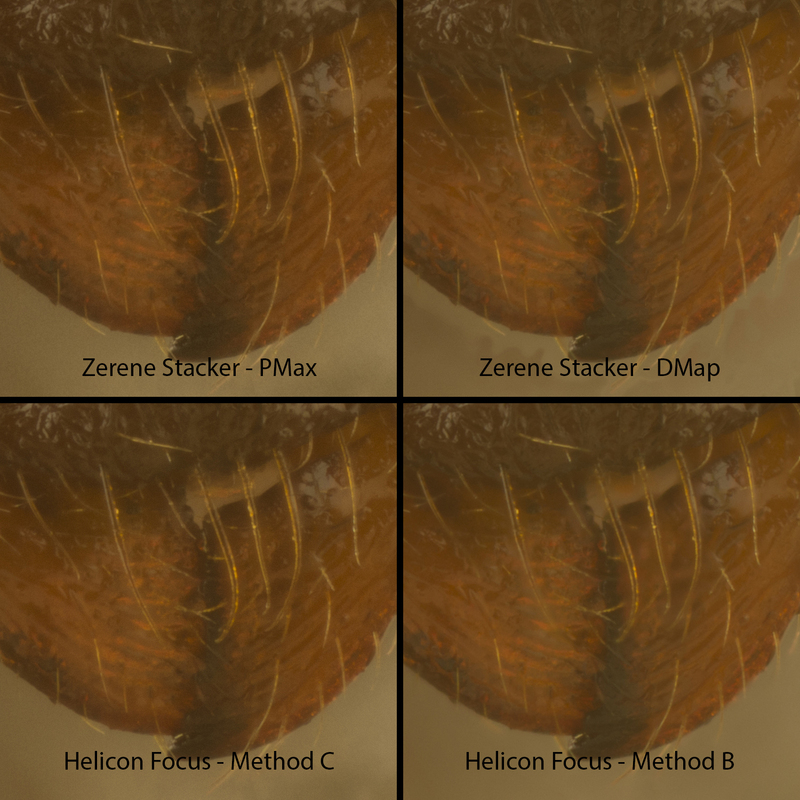 In Helicon Focus when even all three methods combined it still takes less time then PMax calculation of Zerene Stacker alone. I am testing TIF vs DNG, but I am not sure this entirely related with the image format and loading/decoding times. I believe even I use TIF for both of them, Helicon will be still much faster then Zerene Stacker. The thing is, until there is a RAW pipeline for Zerene Stacker, I wont do a fair time comparison, because if there is a RAW pipeline, I refuse to use anything else. Below there are 4 different 100% crops with all 2 methods from each software. I think Method A in Helicon Focus is out of competition. I couldnt see any more usable part of it when compared with method C and B. However, at the end of the page I provide the original files, so you can check from there if you like. As I told before, PMax and Method C are very similar to each other. Method B and DMap is looking very similar too at the first glance. At some parts Method B is better then DMap, and in some parts vice versa. But with a more carefull inspection, Zerene Stacker results are a little bit sharper in general. It is true that Helicon Focus has a better interface, more responsive and gives you more features like 3 render methods, zdepth output and 3d model output. IMHO, both zDepth and 3d model outputs are not useful. In every case I tried I could not get a usable zDepth and 3d model is nothing but a toy. For me, these are not features that going to sell the product. However, when it comes to speed, Helicon Focus wins the race with a huge difference. With a little sharpness difference you can get about 3.69 times faster results. In another words, with zerene stacker assuming you are using a i7 computer which has 12gb ram and average quality ssd drive, you can finish 10 stacks containing 100 photo each in approximately 7 hours. If you use Helicon focus you can finish the same amount in 2 hours. Personally, I would give another 7 hours for a tiny little bit more sharpness. After all, the whole point using dof stacking softwares are getting the optimum sharpness/dof ratio. Whole idea ends up fighting with diffraction. In macro photography there are so many things that can affect the sharpness of the image, so yes no matter what the speed is, I would always choose the sharper. On the other hand, the difference is so tiny, I am not sure that everyone will be thinking as I do. I appreciate if you share your thoughts. At this point, I think the best move that Zerene could do is adding dng support. I believe this would be a great improvement above any other feature. Thanks for the excellent comparison. I think I’ll try the demos and see if the speed difference is worth it for me as a very occasional user for almost always stacks with 20 or fewer images. And mostly landscape over macro, too. Like you, I prefer the sharpness, tiny as the difference is.